The craveable taste of sweet corn topped with crema and spices. This street corn recipe is all the fun of a festival at home. 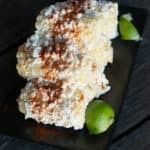 This Mexican Street Corn recipe is my favorite way to eat corn on the cob – and an easy way to really wow your friends at the next BBQ or picnic with a fun twist on the traditional dish. Every summer, our neighbor Bobby Houlding starts dropping boxes of his fresh sweet corn and tomatoes off on my parents’ porch on his way home (of course, my father returns the favor when our pomegranates are ripe). I’ll eat corn on the cob any-which-way, but I’ll always love Mexican Street Corn best. 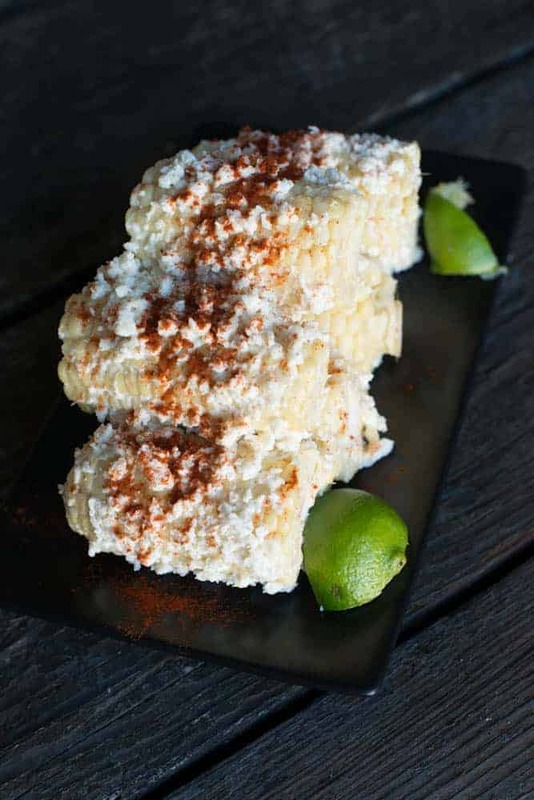 Commonly found at roadside food carts in Mexico, this street corn recipe can be boiled or grilled before being coated with crema or mayo & spices. When I’m at a fair, rodeo or outdoor event, I look for the Mexican Street Corn vendor first. When there’s no show in town, I make it at home. Half each ear of corn by scoring with a large chef knife and snapping. Boil corn in salted water for 5 to 8 minutes, or until just tender. Spread corn with a thin layer of crema, then roll in cheese to coat. Sprinkle with cayenne. Squeeze lime juice over the top of the corn, serve with additional lime wedges if desired. This entry was posted in Recipes, Side Dishes and tagged dinner, gluten free, gluten free cooking, kc cornwell, side dish, summer. Bookmark the permalink.